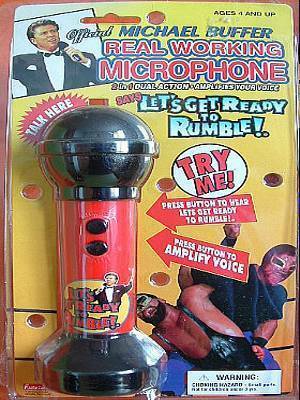 Someone Bought This: Michael Buffer microphone toy - WrestleCrap - The Very Worst of Pro Wrestling! What kind of loser kid aspires to be Michael Buffer instead of a wrestler, anyway? 4 Responses to "Someone Bought This: Michael Buffer microphone toy"
please more insults on the tacky microphone. I’ll take all the free advertising I can get. Me, sort of. As a kid my 2 great loves were wrestling and radio (still are, actually) so I thought being a ring announcer would be pretty awesome. Plus Buffer made a lot of money for spitting his catch phrase and screwing up everyone’s names. 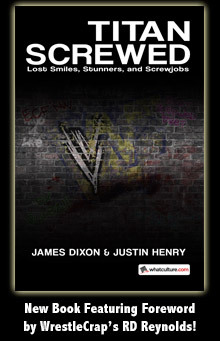 Sponsor the One-Off WrestleCrap Radio!